Janine Balekdjian is a third-year Slavic Studies major at Columbia University. She is the President of the Columbia Democrats. 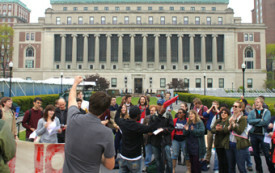 More than one hundred Columbia students congregated in the middle of campus to express solidarity with labor and their own personal frustrations with an economy that is run increasingly by the 1%, for the 1%. Behind their hoodies and hijabs, a diverse section of Columbia students gathered: men and women, black, white, and brown, Christian, Jewish, Muslim, and atheist.